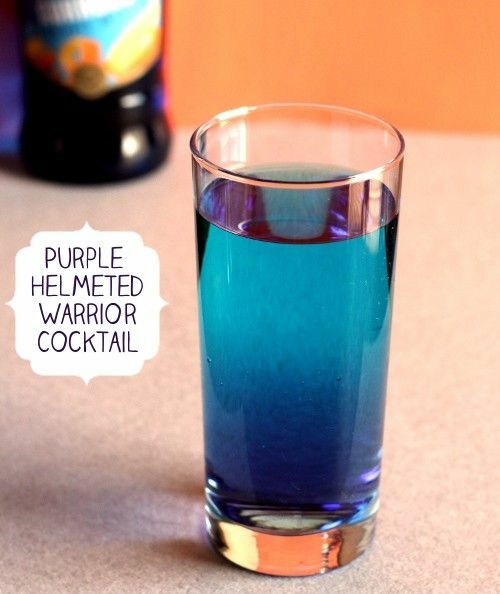 The Purple Helmeted Warrior cocktail features the flavors of orange, peach, lime, lemon and berry. It’s purple and bubbly, hence the name, but probably should not be worn as a helmet. This is a tasty little fruity drink with a nice visual effect from dropping the grenadine down the middle at the very end – it turns into a purple cloud. It’s easy to fix for friends and look cool doing it. Pour all the liquors into a tall glass and stir. Add 7-up to taste, and then drop the grenadine right down the middle of the drink.